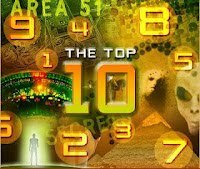 Frank Kimber may have new "Smoking Gun"
The 2011 Roswell Festival finished up this past Monday July 4, 2011 and there were no shortage of ufologists; an all star panel met for the first time to discuss area 5 1, the Roswell incident and a host of other topics. Roswell is a household name, and mostly due to the research of a handful of men. Four of the top Roswell researchers met this past Saturday at the Roswell UFO Museum during their annual festival along with a gentleman with a new discovery. These four researchers have never been together on a panel before. Panelists from left: Frank Kimbler, Kevin Randle, Don Schmitt, Tom Carey, and Stanton Friedman. 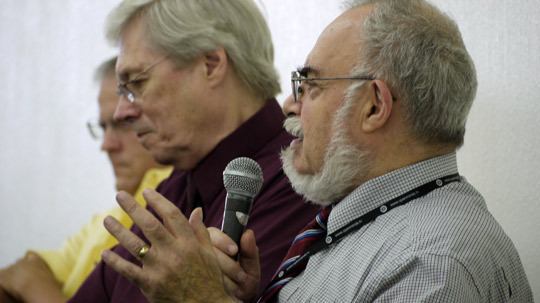 The panel included nuclear physicist, Stanton Friedman, Don Schmitt, Tom Carey, Kevin Randle, and Frank Kimbler. Although the incident took place in 1947, once the Air Force claimed they had mistaken pieces of a weather balloon for a crashed flying saucer, the story quickly faded away. However, Friedman shared how he rekindled this case. In 1978, embarrassed for making Friedman wait for an interview, a Baton Rouge, Louisiana TV station manager gave him a tip. He told Friedman that he should contact one of his ham radio buddies for information on UFOs. This buddy turned out to be Jesse Marcel, the Air Force intelligence officer who was the first to look at the debris. He told Friedman about the strange properties of the material and that it was definitely no balloon. Friedman enlisted the help of a fellow researcher, Bill Moore, and within a couple of years they had located over 60 other witnesses. This work all culminated into the book, The Roswell Incident, written by Bill Moore and Charles Berlitz, and featuring Friedman’s work. Still not a household name, the Roswell event continued to gain popularity and was eventually featured on the television program Unsolved Mysteries. The episode was very popular, and left the public hungry for more information. In the right place at the right time, Schmitt and Randle published their research on the incident in 1991,UFO Crash at Roswell, which included more witnesses and details. During the panel they each discussed some of the more interesting interviews, and recalled just how difficult it was to track these people down. Friedman had gained access to a Roswell Army Air Field yearbook with names and pictures of the men who were stationed there in 1947. Much of the work of the researchers consisted of tracking these people down to find out if they had any involvement with the alleged UFO crash. Prior to the internet and cell phones with long distance included, it was an expensive and tedious task. Friedman explains to the audience how it all began. Friedman wrote his own book on Roswell titled, Crash at Corona, in 1992, and Schmitt and Randle published a second in 1994. This was the same year that a Showtime movie aired titled, Roswell, based on Schmitt and Randall’s first book. The movie starred Kyle McLachlan and Martin Sheen. All of this momentum launched the Roswell UFO Crash into the worldwide sensation that it is to this day. Randle shared the story of how he got involved with Roswell in the first place. 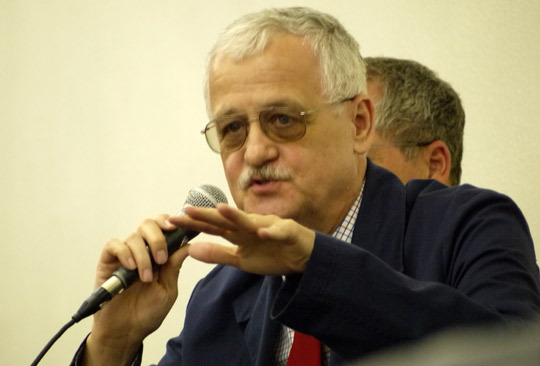 In the late eighties, he was a science-fiction writer, and while attending a conference was asked to take part in a debate. 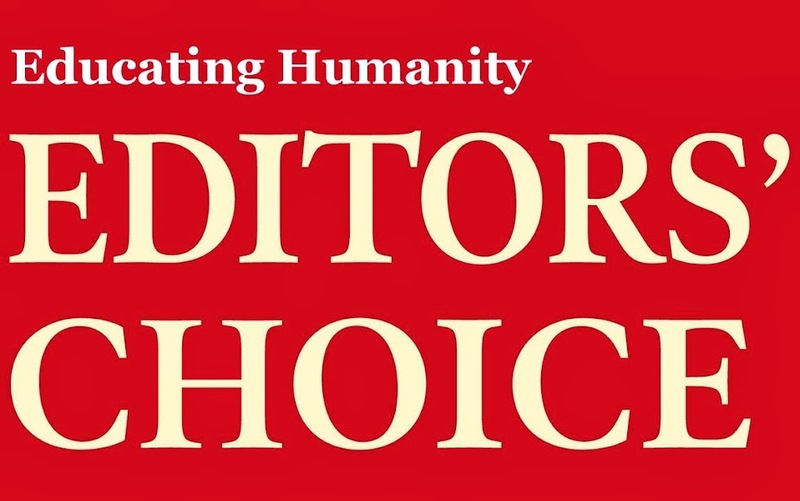 He and three other writers were going to debate two UFO researchers. The second UFO researcher wasn’t able to make it, so to make things fair, Randle volunteered to debate on the UFO side. His partner was to be Schmitt. This was the beginning of Schmitt and Randle’s partnership. Kevin Randle shares research stories. Randle has also had a long career in the military, serving with the Army in Vietnam and the second Gulf War. After 911, Randle joined the Iowa National Guard, and his unit was deployed to Iraq in 2003. Randle eventually retired from the military as a Lieutenant Colonel in 2009. He says this obviously hampered his ability to participate in UFO research. During this time, Schmitt took on a new partner, Tom Carey. Inspired by Friedman’s work, Carey wanted to get involved with the research himself. After meeting Schmitt they teamed up and eventually published, Witness to Roswell, in 2007. The book highlighted their continued discovery of witnesses to the events. 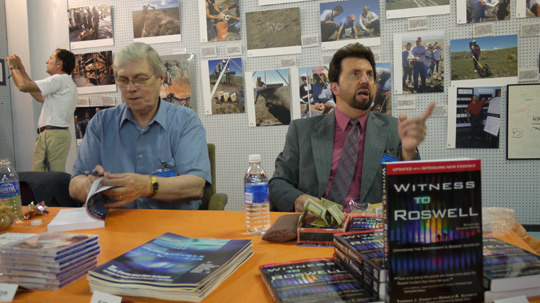 Don Schmitt and Tom Carey signing books and talking to visitors in the Roswell UFO Museum. 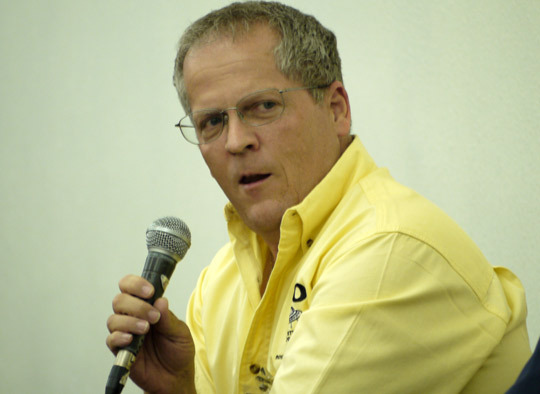 The last panelist is not a long time researcher, but a newcomer to the search for answers to the Roswell mystery. Frank Kimbler is a teacher of geology at the New Mexico Military Institute in Roswell. Taking an interest in the case, he was able to spot an unusual scorch pattern in infra-red satellite images of the desert near where the debris was supposed to have been found. He then went out to the site and found unusual metals. Under analysis the material tuned out to be an aluminum silicate. He then was able to get the Roswell UFO Museum to sponsor an isotopic ratio analysis which also came back with interesting results. From what they discovered, the sample he gave them was not created on earth. Kimbler says he is a scientist and is handling this carefully. There is a possibility that the first lab made a mistake. He will seek further analysis to make sure the findings are correct. Frank Kimbler explains his discovery. After all of these years, could Kimbler have the “smoking gun” evidence that everyone has been waiting for? Open Minds Radio this Monday to discuss this further. Overall, the panel was great. Hearing the various perspectives on how this amazing case unraveled from the lead investigators, all together for the first time, was a UFO geek’s paradise.